Dr. Joanne Starr, CHOC Children’s pediatric cardiothoracic surgeon, discusses the signs, treatment and long-term outcome of children born with Tetralogy of Fallot, a heart condition made up of four related congenital heart defects. Tetralogy of Fallot (TOF or “TET”) is a heart condition made up of four related congenital (present at birth) defects that occur due to abnormal development of the fetal heart during the first eight weeks of pregnancy. Ventricular septal defect (VSD). An opening in the ventricular septum, or dividing wall between the two lower pumping chambers of the heart known as the right and left ventricles. Learn more about VSD. Pulmonary (or right ventricular outflow tract) obstruction. A muscular obstruction in the right ventricle, just below the pulmonary valve, that decreases the normal flow of blood to the lungs. The pulmonary valve may also be small. Overriding aorta. The aorta (main artery leaving the heart) is shifted towards the right side of the heart so that it sits over the ventricular septal defect. Right ventricular hypertrophy. The right ventricle becomes thickened as it tries to pump blood past the obstruction into the pulmonary artery. Normally, oxygen-poor (blue) blood returns to the right atrium (collecting chamber) from the body, travels to the right ventricle (pumping chamber), then is pumped through the pulmonary artery into the lungs where it receives oxygen. Oxygen-rich (red) blood returns to the left atrium from the lungs, passes into the left ventricle, and then is pumped through the aorta out to the body. In tetralogy of Fallot, the direction of blood flow within the heart varies, and is largely dependent on the size of the ventricular septal defect, and how severe the obstruction in the right ventricle is. With mild right ventricle obstruction, very little of the oxygen-poor (blue) blood in the right ventricle will pass through the VSD to the left ventricle, mix with the oxygen-rich (red) blood there, and then flow into the aorta. The majority of the oxygen-poor (blue) blood will go by its normal route to the lungs. These children may have oxygen levels that are only slightly lower than usual, and do not appear blue. Some congenital heart defects may have a genetic link causing heart problems to occur more often in certain families. Tetrology of Fallot may also occur as part of a genetic syndrome like Down syndrome or DiGeorge syndrome. Most of the time, this heart defect occurs by chance, with no clear reason for its development. The amount of oxygen-poor (blue) blood that passes through the VSD to the left side of the heart varies. If the right ventricle obstruction is severe, or if the pressure in the lungs is high, a large amount of oxygen-poor (blue) blood passes through the VSD, mixes with the oxygen-rich (red) blood in the left ventricle, and is pumped to the body. The more blood that goes through the VSD, the less blood that goes through the pulmonary artery to the lungs, and the less oxygen-rich (red) blood that returns to the right side of the heart. Some situations, such as crying, increase the pressure in the lungs temporarily, and increasing blueness might be noted as a baby with tetralogy of Fallot cries. In other situations, the pathway from the right ventricle to the pulmonary artery becomes tighter, preventing much blood from passing that way, and allowing oxygen-poor (blue) blood to flow through the VSD into the left heart circulation. Both of these situations are nicknamed “TET spells.” Usually, TET spells resolve after the baby calms down, but on rare occasions, they may continue or get worse, which can be a medical emergency. Sometimes, steps can be taken to lessen the pressure or the obstruction, and allow more blood to flow into the lungs and less through the VSD. These steps, however, are not always effective. The following are the most common symptoms of tetralogy of Fallot. However, each child may experience symptoms differently. Because large amounts of oxygen-poor (blue) blood can flow to the body under certain circumstances, one of the symptoms of tetralogy of Fallot is blueness (blue color of the skin, lips and nail beds) that occurs with such activity as crying or feeding. Some babies do not have noticeable cyanosis (blue color of the skin, lips and nailbeds), but may instead be very irritable or lethargic due to a reduced amount of oxygen in the bloodstream. Any of these can be symptoms of tetralogy of Fallot. The symptoms of tetralogy of Fallot may resemble other medical conditions or heart problems. Always consult the child’s doctor for a diagnosis. If a child’s doctor detects a murmur during a physical examination, the child may be referred to a pediatric cardiologist for a diagnosis. If the heart murmur is caused by the turbulence of blood flowing through the obstruction from the right ventricle to the pulmonary artery, the cardiologist will diagnose the child with tetralogy of Fallot. The child’s symptoms also help with the diagnosis. 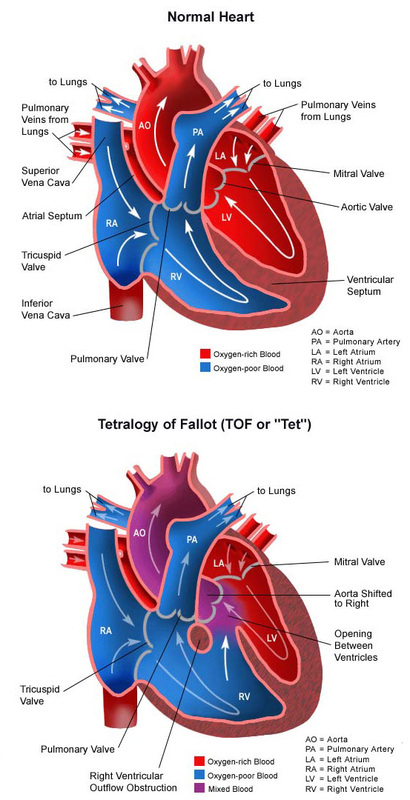 Tetralogy of Fallot is treated by surgical repair of the defects. A team of cardiac surgeons does the surgery, usually around 6 months of age, or even earlier, if the baby is having problems with TET spells. Repairing the heart defects will allow oxygen-poor (blue) blood to travel its normal route through the pulmonary artery to receive oxygen. The operation is performed under general anesthesia, and involves closing the ventricular septal defect with a patch and opening up the blocked pathway between the right ventricle and the pulmonary artery is with a patch. If the pulmonary valve is small, it may be opened as well. What can families expect after surgery for tetralogy of Fallot? Children who undergo treatment for tetralogy of Fallot spend time in the cardiovascular intensive care unit (CVICU) after the repair. During the first several hours after surgery, the child will be very drowsy from the anesthesia that was used during the operation, and from medications are given to relax him or her and to help with pain. As time goes by, the child becomes more alert. Ventilator. A machine that helps the child breathe while he or she is under anesthesia during the operation. A small, plastic tube is guided into the windpipe and attached to the ventilator, which breathes for the child while he or she is too sleepy to breathe on his or her own. After a tetralogy of Fallot repair, some children may remain on the ventilator for up to several days so they can rest, while others may be able to breathe on their own within a few hours of the surgery. The hospital care team will provide families with information on how long they expect the child to need a breathing tube. How is a child cared for at home after tetralogy of Fallot surgery? Pain medications, such as acetaminophen or ibuprofen, may be recommended to keep the child comfortable at home. The child’s doctor will discuss pain control before the child is discharged from the hospital. After surgery, older children can usually handle light activity for a short amount of time. Children usually become tired easily and sleep more than before surgery. Within a few weeks, however, the child should be fully recovered. What is the long-term outlook for children diagnosed with tetralogy of Fallot? Most children who have had a tetralogy of Fallot surgical repair live healthy lives. Activity levels, appetite and growth return to normal in most children soon after surgery. The child’s cardiologist may recommend that antibiotics be given to prevent bacterial endocarditis after discharge from the hospital. After initial repair of tetralogy of Fallot, pulmonary valve replacement may be needed as the child nears or reaches adulthood to prevent complications, such as enlargement of the right ventricle, abnormal heart rhythms and heart failure. In adulthood, women considering having a baby should speak with their cardiologist before getting pregnant. The child’s healthcare team will provide more details on the specific long-term outlook for the child.